The energy reclassification of heating and air conditioning systems that has taken place over the last few years has brought to light a problem which has always existed, but until now has remained hidden: the presence of impurities caused by corrosion and incorrect system management over time. WHY TO INSTALL DIRT SEPARATORS IN THE CIRCUIT? This dirt, often ferrous in nature, can block and seriously damage modern devices which have been fitted to increase the efficiency of systems, such as condensing boilers, variable speed circulators and regulating valves. For this reason, the quality of the water used must be improved, at least as far as the performance level of the components installed is concerned. This is the only way that the system can continue operating at maximum efficiency and operating costs can be reduced.Over the years some very efficient cleaning devices have been introduced, but these have technical limitations which make them suitable only for certain types of system. Efficient strainer operation, for example, is limited to impurities which are not too small, with a significantly increased pressure drop suffered by the device within the system. Furthermore, it is a component which is subject to high levels of clogging and therefore frequent maintenance is required. WHY TO INSTALL A SELF-CLEANING DIRT SEPARATOR? Dirt separators - preferably versions with built-in magnets - have been particularly successful as they are less susceptible to blockages and can retain very small particles. Their only limitation is carrying out their task in subsequent steps. 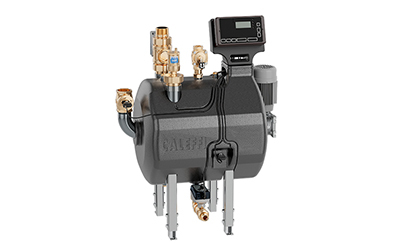 Filling this gap was Caleffi’s motivation when developing its latest water treatment product. To fulfil the delicate task of cleaning systems containing large amounts of dissolved impurities, it was essential to design a product that could guarantee ultra-high standards of cleanliness while incorporating all the advantages of the various components. An automatic cleaning mechanism, which minimises the human intervention required for maintenance purposes, was fitted and the self-cleaning magnetic dirt separator strainer DIRTMAGCLEAN® came into being. self-cleaning at regular intervals, in accordance with a pre-set schedule or when a certain level of clogging is detected automatically. DIRTMAGCLEAN® is ideal in central heating systems within medium-large climate control structures, for the complete removal of any impurities and dirt. HOW DOES THE SELF-CLEANING DIRT SEPARATOR WORK? This device, as mentioned previously, combines the principle of decantation (by depositing a large amount of dirt in the collection chamber outside the medium flow line) with the action of specific filtering elements through which all the system water flows. The extremely fine filter mesh progressively blocks particles down to 2 µm in size. At the same time, ferromagnetic impurities are separated by magnets on the surface of the mechanical cleaning elements. This guarantees total cleanliness of the carrier medium, while maintaining pressure drop values at acceptable levels in spite of gradual saturation. Once the operating chamber has been drained, the internal filtering elements begin a rotary action thanks to high-speed water jets and brushes which remove surface dirt, encouraging it to fall into the collection chamber which is then emptied. In the final phase of the process, the DIRTMAGCLEAN® is recharged with filling water until the system pressure value is reached. Another innovation which deserves a separate mention? Management of the self-cleaning magnetic dirt separator strainer, either by the built-in digital regulator or remotely by means of the BMS system with MODBUS-RTU protocol.